It didn't appear to be a test of a nuclear device or a long-range missile with the potential to target the U.S.
SEOUL, South Korea — North Korean leader Kim Jong Un observed the successful test of an unspecified "newly developed ultramodern tactical weapon," state media reported Friday. It didn't appear to be a test of a nuclear device or a long-range missile with the potential to target the U.S. A string of such tests last year had many fearing war before the North turned to engagement and diplomacy. The North hasn't publicly tested any weapons since November 2017, but in recent days Pyongyang reportedly expressed anger at U.S.-led international sanctions and ongoing small-scale military drills between South Korea and the United States. Diplomacy has stalled since a summit between Kim and President Donald Trump in June, with Washington pushing for more action on nuclear disarmament and the North insisting that the U.S. first approve a peace declaration formally ending the Korean War and lift sanctions. On Thursday, Vice President Mike Pence told NBC News the U.S. will not require North Korea to provide a complete list of its nuclear weapons and missile sites before Trump and Kim meet for a second time. That meeting, slated for after the New Year, will be where a "verifiable plan" to disclose the sites and weapons must be reached, Pence said. "Now we need to see results," he added during a wide-ranging interview on the sidelines of a meeting of Asian leaders in Singapore. In Washington, in response to the North Korean announcement, a State Department spokesman said, "We remain confident that the promises made by President Trump and Chairman Kim will be fulfilled." Yang Wook, a Seoul-based military expert, said a "tactical weapon" in North Korea refers to "a weapon aimed at striking South Korea including U.S. military bases" there, so the North may have tested a short-range missile or a multiple rocket launch system. North Korea has continued to showcase its conventional military capabilities, including at a large military parade in Pyongyang, its capital, on September 9. The test may also have been a response to recent joint military drills by the United States and South Korea, which Pyongyang said violated recent pacts to halt to "all hostile acts," said Yang Uk, an analyst at the Korea Defence and Security Forum. Kim said the weapons system tested was one in which his father, Kim Jong Il, had taken a special interest during his lifetime, personally leading its development. 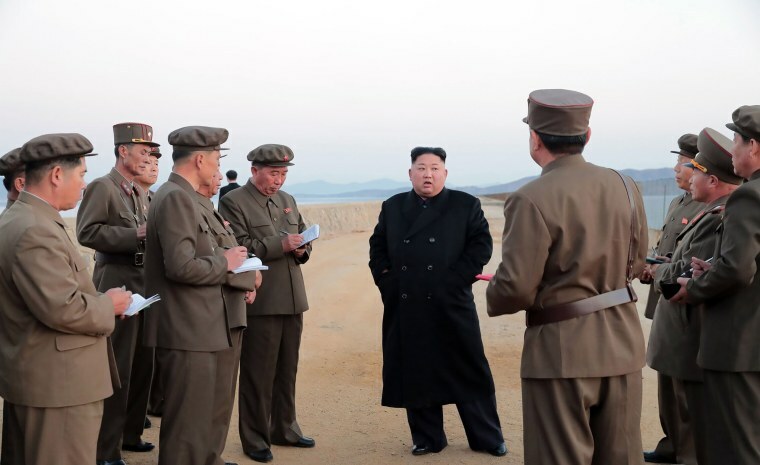 Kim's last publicized military inspection was the launch of the Hwasong-15 intercontinental ballistic missile (ICBM) on November 29 last year, though he engaged in at least eight other military related activities this year, the South's Unification Ministry said.